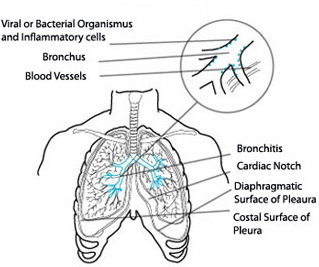 Acute bronchitis is an infection of the bronchial tree. The bronchial tree is made up of the tubes that carry air into your lungs. When these tubes get infected, they swell and mucus (thick fluid) forms inside them. This makes it hard for you to breathe. Only about 5-10% of bronchitis cases are caused by a bacterial infection. Most cases of bronchitis are caused by a viral infection and are "self-limited" and resolve themselves in a few weeks. Acute bronchitis should not be treated with antibiotics unless microscopic examination of the sputum reveals large numbers of bacteria.